No, the neighbors would complain if I did. A Wolf. I've always liked wolves and my nickname up in my job in Alaska is Nightwolf which I might add, was given to me without my input lol. Horror and Comedy all in one. My wife, she's always there when I need her to be. I don't remember, I was tired and fell asleep like I was clubbed. Louis for my father (and grandfather and great grandfather) and Alexander for Alexander Graham Bell. A few times, but never like I am with my wife. Yes, I was falsely accused of several charges by my stepfather and could have gone to prison for 15 years. All charges were dropped. Yes, lipo to get rid of my effen gut. Yes, I've been trout fishing many times. #41 must have been a really awful experience. interesting answers you got here. have a good Sunday! Great answer for #29. 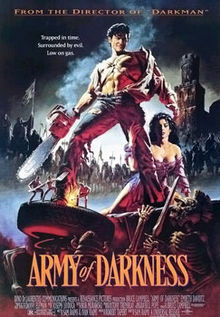 Army of Darkness is a favorite of mine. And a year and a half without seeing your wife? I start to twitch if I have to sleep away from her for a weekend. Your answer to #41 is scary and we're glad that the charges were dropped. Boy, that black hair sure is popular. 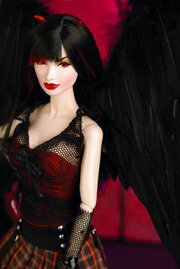 I'm a bit surprised as a dark brunette - everyone always seemed to prefer blondes. That's a long time to be away from your partner - have a happy reunion! A year and half? That's a long time, you have to be so excited. Wolves are such beautiful creatures. They're one of my favorite animals. Great answers, I had fun reading them! Happy Sunday.